The Contractors - Drone Inc. Despite the popular myth that drones are clandestine tools operated by the CIA to kill America’s most wanted, the aircraft are really just one element of a vast surveillance system operated mostly by enlisted soldiers. The Air Force takes the lead on flying and managing drones, with support from the other military services and a mix of intelligence agencies. But rarely acknowledged are the thousands of contractors working alongside government employees to manage the high-tech hardware and software. Laws governing inherently governmental work bar contractors from making targeting decisions or firing missiles, but they do play a critical role in the development, testing, fielding, and maintenance of these technologies as well as in analyzing raw data, for which they are almost never held to account. 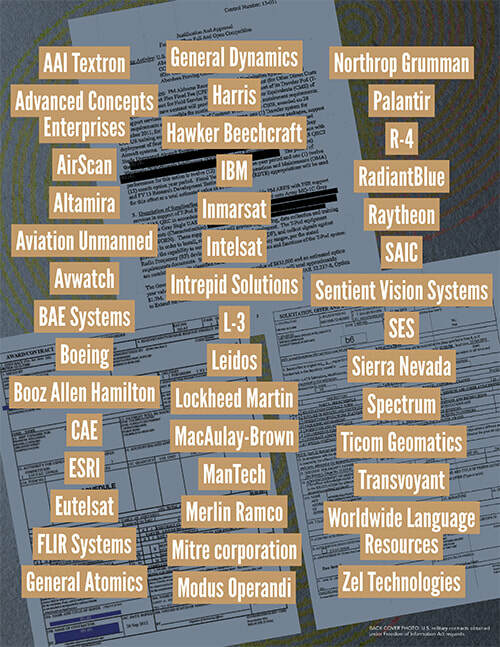 As described in previous sections, there are literally dozens of for-profit companies in the drone business from tiny outfits like IISi with six staff to big guns like Lockheed, Raytheon, and Northrop Grumman which employ small armies of people. By far and away, the most important company in this business is General Atomics, which makes the Predator and Reaper, builds the Hellfire missiles, and even provides many of the pilots. But it is likely that companies like L-3 earn just as much from drones, depending on how one categorizes the contracts. Unfortunately, there is no known official system to track the role of these corporations. But by explaining their specific roles inside and in the context of the military kill chain, we’ve attempted to chart their scope. Bear in mind that DCGS alone uses some 70 sub-contractors, perhaps many more, so a single chart cannot encompass or explain the extent of the enterprise—even if the information were easily available. Some of the smaller companies are glorified employment bureaus used to provide payroll and other services so commanders can retain soldiers after they finish their service contracts. Then there are even fake companies that the CIA sets up, with no more than a post office box, in order to hide operations from reporters and perhaps even from lawmakers.